Price action among euro pairs was mixed due to counter currency influences, but with a string of negative data from Europe all week, the euro comes out net negative going into the weekend. Global risk sentiment was an influence on euro pairs this week, and for a broader rundown of what drove global risk sentiment, check out my review of this week’s risk sentiment drivers and its effects on market behavior in my Japanese yen weekly review here. 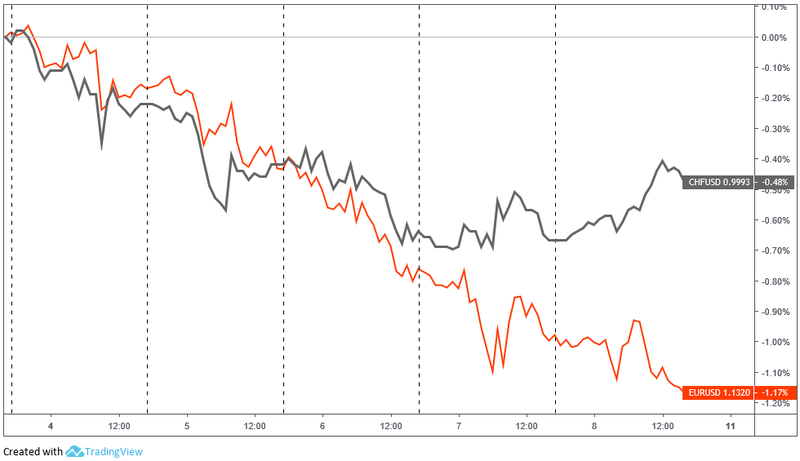 In short, we saw early risk-on sentiment to start the week (likely a carry over from Friday’s bullish sentiment on positive U.S. data), which is likely the reason why we saw the euro’s performance against the comdolls lag versus the safe havens on Tuesday. But traders turned bearish on risk assets from Wednesday on as the picture of global growth turned gloomier, mainly on a heavy week of negative economic reports from around the globe. 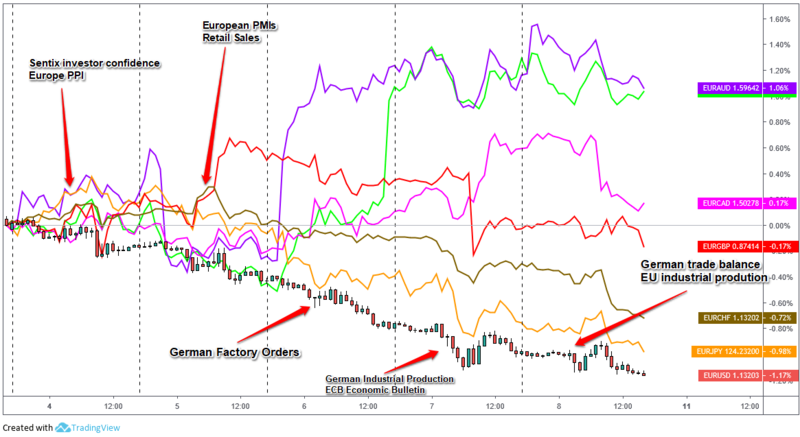 In fact, European data was a huge contributor to the broad sentiment change; the long list of headlines at the beginning of the this article show European data mostly disappointing euro bulls all week, including weaker reads on producer prices, investor sentiment, and retail sales data. And let’s not forget the Brexit deal impasse that’s raising the probability of a “no deal” Brexit, which could be a big problem for Europe as well as the U.K.
After eyeing the euro pairs overlay chart above for a while, there doesn’t seem to be a strong argument for a single European catalyst sparking a uniform move among euro pairs, with maybe an exception to somewhat of a selloff on Thursday after the weak German industrial production numbers. 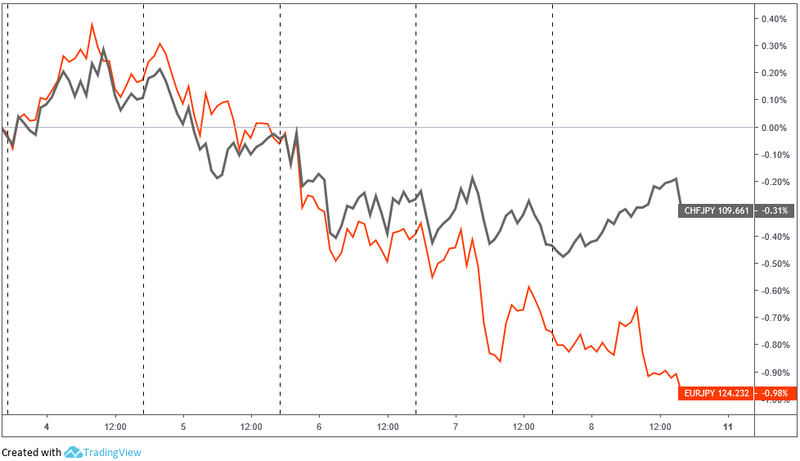 And can be observed that price action was mixed with the euro losing out to the safe haven currencies and Sterling at the week’s close, but it managed to come out positive against the comdolls who suffered more from the broad risk-off sentiment and from their own individual issues (e.g., dovish comments from RBA Lowe, weak NZ employment data, falling oil prices) that pushed the AUD, NZD, and Loonie lower against the euro. Overall, thanks to the fresh round of weak European data and Brexit drama, the euro was a net loser on the week as the European economic outlook continues to weaken the further we go into 2019. With seemingly no reaction to this week’s foreign currency reserves and unemployment data from Switzerland, falling risk sentiment was the likely driver for Swiss franc pairs. And as mentioned in the euro recap above, global risk sentiment started the week in the “on” position, which is likely the reason why we saw the franc’s under performance grow against the rest of the majors through Tuesday’s trade. 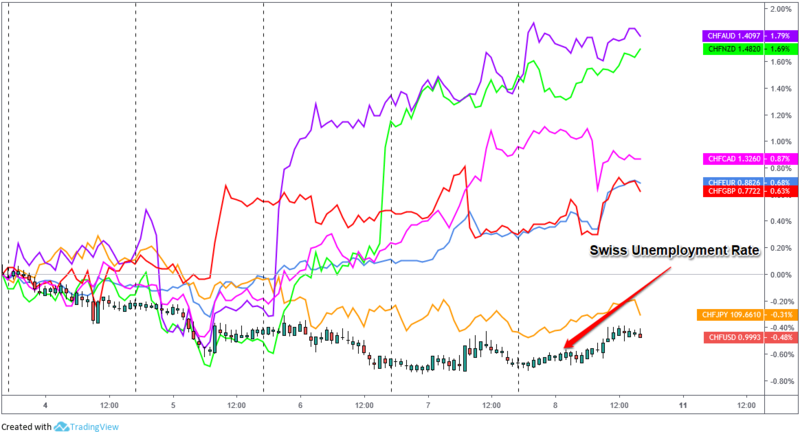 Traders flipped back to risk-off from Wednesday to the end of the week, also flipping the Swiss franc’s fortune against the high-yielders and the other European currencies to positive, but falling against the other safe haven currencies (JPY & USD) at the end of the week. And as usual, the Swiss franc tracked euro directional movements throughout the week, but began to out perform the euro when global risk sentiment shifted towards negative, and likely due to the weak economic reports from the Germany, France and Italy putting additional pressure on the euro as seen below.